Instead of spending her days in classrooms at St. Cloud State University last semester, Crystal Jimenez spent her days in a castle in England where she lived, took classes, and learned more than she ever imagined she would. Living in a castle was just one of the highlights for Jimenez, a sophomore at SCSU, who recently returned from a semester abroad in England. "I learned a lot about myself," said Jimenez about her experiences abroad. "It taught me a lot about having confidence in myself," she added. When students needed a place to relax or enjoy a home-cooked meal, they spent time with host families in the nearby town. 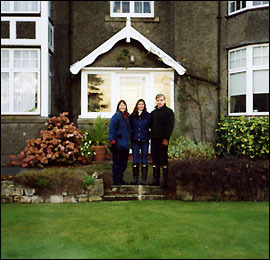 Jimenez in center is pictured here with her host parents. 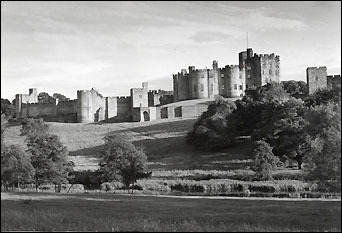 Jimenez and 32 other SCSU students spent their fall semester living in Alnwick Castle - home of the Duke and Duchess of North Umberland and the location of the Quiddich matches featured in the "Harry Potter" movies - where they lived and learned together and grew to be very good friends. While living in the castle, SCSU professors taught subjects such as biology, but the best part of Jiminez's educational experience was learning about the country's history and culture from British professors who taught contemporary British history and medieval history. Learning medieval history was fascinating for Jimenez, who took a special interest in medieval coats of arms, castles, and architecture. She was also fascinated to learn about England's religious history. Part of the learning process involved frequent field trips to places where students could experience history firsthand. The first trip was to Hadrian's Wall, a 73-mile wall built by the Romans nearly 2,000 years ago to separate Roman-ruled England from the barbaric Scots. Visiting the wall was Jimenez's first indication that life in England was a little different than life at home. Brits walk everywhere, said Jimenez. Just to get to the wall was a three-mile walk, and her British guides thought it was no big deal, but to Crystal, three miles was a long walk, she said. Eventually, she got used to walking everywhere. Other field trips included visits to Stonehenge, which Jimenez didn't think was very mystical because a highway ran right past it; to Lindisfarne-Holy Island, which is considered the birthplace of Christianity in England; to the Globe, a re-creation of William Shakespeare's original theater; and to Shakespeare's birthplace at Stratford-upon-Avon. Jimenez, a sophomore at SCSU, spent a semester living and learning at Alnwick Castle in North Umberland, England. Jimenez had three weeks during the semester to do some traveling on her own. Twice, she struck out alone to visit places she's only dreamed of visiting before. On one trip, she spent a week traveling around England, where she took in a play nearly every night, and later she spent two weeks in Ireland. She visited Dublin, a city much like many in the United States, Jimenez said. She also visited Belfast in Northern Ireland, where she tried to leave with a deeper understanding of the conflict between Protestants and Catholics - a conflict she thought was more political than religious in principal. It was during these trips, where she lived in hostels and bed and breakfasts, that Jimenez said she learned the most about herself. Traveling alone can be scary, she said, and Jimenez learned how to take chances and to trust herself on theses trips, skills she may not have learned in a classroom in St. Cloud. While much of the castle that Jimenez called home during the semester was maintained or restored to its original state, the tower where the students lived had been converted into large but very ordinary dorm-like rooms, said Jimenez. Traveling and living in a castle sometimes took its toll on the students, according to Jimenez. "It was strange, living in the middle of a tourist attraction," laughed Jimenez. To spend time away from the castle or to relax after a hectic week of classes and tours, many of the students found the comforts of home with families in the community where students could go for a meal, or to visit for a long weekend or a holiday. Jimenez's host family was a couple of doctors with a 13-year-old-daughter. While she didn't get to spend as much time with them as she wanted, the time spent together was wonderful, she said. The best times, said Jimenez, were spent watching TV, bowling, or just sitting around chatting, as sometimes living in a castle can be weird and she just needed to get away. Jimenez also made friends with others in the community that she met at the local pub, through her host family, or while volunteering at the local charity bookstore. She didn't want to leave so soon, after four months, and she promised her new friends that she would be back. SCSU has been sending students to study in England for over 20 years. Jimenez knew she wanted to study abroad soon after starting college last year. She chose the England program because she wanted to live in a castle and because she already understood the language. Financially, studying abroad was a sacrifice, she said, but it was well worth it. Jimenez was able to work some of the trip costs into her financial aid, and as a member of the work-study program at college, she was able to continue working at the castle. "It was worth the financial sacrifice and more," said Jimenez. "What I brought out of it was incredible," she added. Now she can't wait to go back.